We supply welders and leads for use with our grundomat piling hammers and dropweight piling rigs when installing steel cased bottom driven piles. 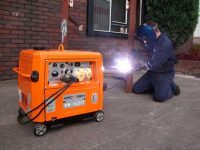 Mini Piling Plant Hire stock a wide range of welders, welder generators, welding leads, welding rods, welding masks and other accessories for delivery or collection nationwide. For use with Grundomat hammers and dropweight piling rigs when installing Bottom Driven piles.